NUGEN’s Post on Promo. Save $500 on list price ! Get NUGEN Post Here at $999 ! 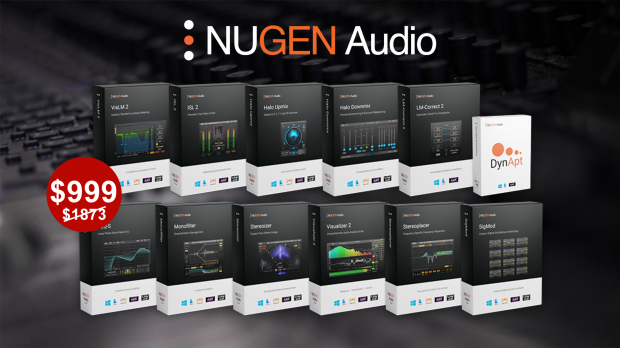 NUGEN Post is an uncompromising collection of eleven must-have plug-ins for high quality broadcast, film and game audio production. Containing a complete loudness solution including True Peak limiting, leading upmix and downmix tools, a comprehensive audio analysis suite, transparent auto-match EQ and 3 stereo control plug-ins, NUGEN Post delivers the same essential post production tools used by leading facilities the world over. Mix towards compliance without breaking the creative flow, listen to True Peak audio ‘in-place’, and achieve faster than real-time quick-check-and-fix processing. Take complete control of your stereo and surround panorama with powerful tools offering incredible flexibility in highly accessible and configurable combinations. Each plug-in integrates advanced audio analysis feedback directly into the user interface, delivering intuitive control of all the main parameters with clear and immediate dynamic response. NUGEN Post offers you deeper control, sonic enhancement and diagnostic support at any stage of the production process leading to increased quality and efficiency in any project. This entry was posted in DontCrack, Plug-ins, Promotions and tagged DynApt Extension, Halo Downmix, Halo Upmix, Linear Phase EQ, Monofilter, NUGEN Audio, Post, Post Production, SigMod, Stereoizer, Stereoplacer, True Peak Limiter, Visualizer. Bookmark the permalink.